Zee Says: I like makeup. I really do. Like is an understatement. I adore make-up. It makes me happy. I love spending hours and hours at a makeup counter testing all sorts of colors, looking at the packaging, testing it on my hand, and just taking it all in. Attendants at Essenses, MAC, Nars, or Shu Uemura know that I just stuff these things in my bag after purchase. Not because I’m saving paper bags, mind you, but because I just want to avoid MDJ face-palming every time he sees yet another teeny-tiny bag of happiness each and every time I step out. I don’t tell him how much it costs either. Price tags are taken out before he freaks out. A girl has to keep some things private, you know. That would be akin to having him accompanying me to the loo.. err.. the little girl’s room. MDJ: Makeup. Makeup. More and more makeup. Tell me, why does one girl need so much of it? Zee: “Need” is too strong a word to use. I’m appalled that you should even think that I would “need” makeup! Zee: “Lust” would be a better word. Men will never understand the lure of the makeup counter; the beautiful colors all lined up together based on how a girl would feel. 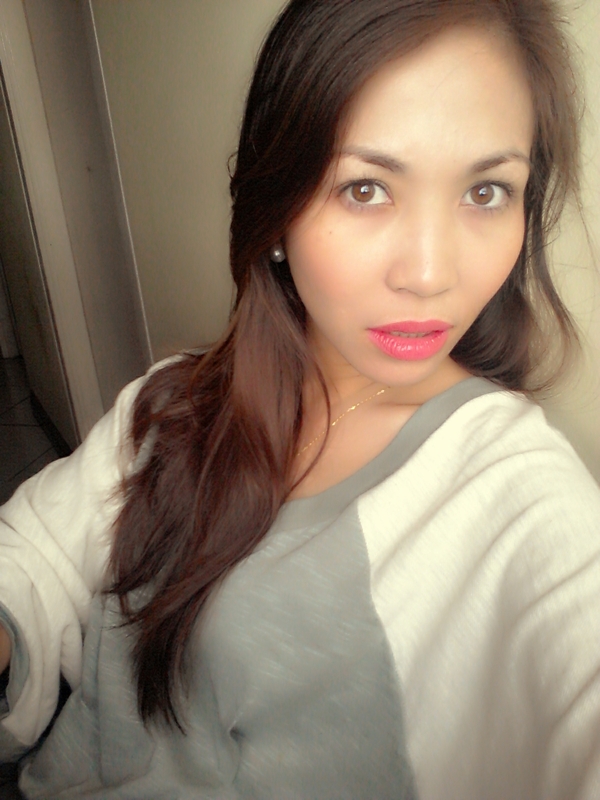 Trying on a new lippie that makes you feel like Angelina Jolie for a few minutes is orgasmic. Angelina Jolie and her pet lips. Zee: That, my dear, it’s why we have been on this “we have to go on a diet” dilemma the past month. If you have emotional eating, some women have emotional beautifying. There are palettes for days when she wants to pretend to be a virginal, blushing teenager, dark smoky ones for a sultry bride-of-Zorro look, vibrant colors that makes everyone think of spring when you step in the room. Of course, there are also the the color palettes for times when you want to look like a Macaw from South America or even Lady Gaga. You’ll never know when you may want to feel like looking that way. For some girls it’s probably often, because I see a lot of Macaws and Lady Gaga’s at the malls, but I don’t know, that may be their natural palette. It sure looks natural. The point is, you wear and purchase makeup because it evokes positive feelings. Us girls have complicated feelings, thus, more makeup. MAKEUP ALL-YOU-CAN! EXTRA EYEBROW-PLUCKING ON THE HOUSE!! Same thing minus the fat! MDJ: I guess that’s really beyond a man’s DNA. The only really strong feelings I can remember over the last six months probably revolved around “WANT MEAT!” and “BOOBIES!”. And then I wandered off into the woods to do manly things like drink beer, tinker with my car’s transmission, and hunt for elk. Kind of like the Old Spice Guy, except, you know, manlier. 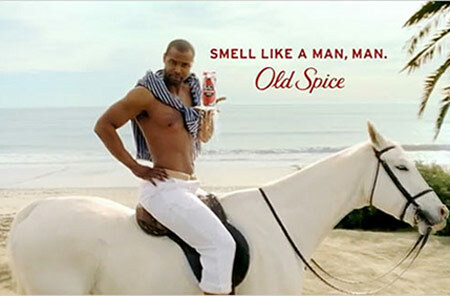 The Old Spice Guy: The man your man could smell like. But going back, what makes a girl want to acquire more and more shades of makeup? I have yet to discern the difference between “Summer Dewdrop Pink” and “Unicorn’s Fantasy Fuchsia,” which are not actual makeup shades, but should be, based on what I’ve read on the labels of your collection. Zee: Those names have relevance! Hmph! Color and packaging also just draw me to buy more. Admittedly, I’ve acquired some purely because of packaging. Which basically is why makeup prices are horrendous. I don’t think a tiny lump of pigmented powder should cost more than a thousand bucks, but pigmented powder in a shiny black lacquered Chanel container with a teeny, tiny, oh-so-darling mirror on it? Yes, yes, a million times yes! In my head, that is. MDJ: These are your current favorites. I don’t know how this could ever compare to the delicate beauty of a newborn baby Baconator, but go figure. Zee’s current arsenal of favorites. 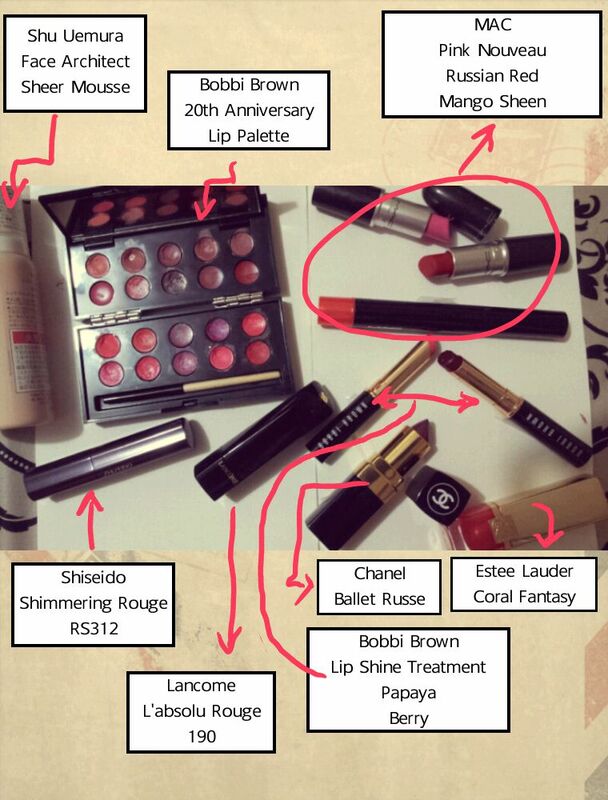 Zee: Correction, my LIPSTICK favorites the past few months. Those babies have stopped me turning into Godzilla when sad the past few months. Makeup is therapeutic. It’s therapeutic to painstakingly do one’s face like a geisha. It’s a ritual. Besides, I like to put my Fine Arts degree to good use. My mother spent for a good college education for me to put on makeup, and put it on well! I make my momma proud! MDJ: And, I hate to admit it, but you make me proud too. There are few joys in a man’s life more precious and sublime than walking hand-in-hand beside a girl whose lips are precisely the shade of a porterhouse steak cooked medium rare. Zee: You’re a pig. I don’t need to justify my purchases. THEY MAKE ME HAPPY! Makeup makes us happy. 🙂 That’s so true! I like what you said about how makeup is a weapon. What’s the male equivalent then, apart from 18″ biceps and Jude Law’s chin? Can’t relate 😦 Baldness took a lot away from my life. …and not just threatening but pretty much any sort of “face”. With makeup, you can [deliberately] present or express yourself differently (look happier when you’re down,healthier when you’re sick, etc), which also partly explains why there is a need for numerous shades of makeup (and types of brushes). I too am baffled by why there is a need for so many shades of make-up. I guess women are different from men….men don’t fix themselves as much when they are already with a person they love…..if you ask them they will most likely reply something to the effect of “bakit pa? wala na naman dapat pormahan pa”. Would you want an ugly partner?? ’nuff said. Kawawa naman si Junior, pang-gatas na nya sana yun..
At wala kang balak, aber? I was looking at some of your articles on this internet site and I conceive this internet site is rattling informative ! Retain posting . I write a leave a response when I appreciate a post on a website or I have something to contribute to the discussion. It is caused by the fire displayed in the post I looked at. And on this article Girls Are From Venus, Men Are Barbarians (Or, The Myth Behind Makeup & Natural Beauty) | He Says, Zee Says. I was actually moved enough to drop a thought 🙂 I do have a couple of questions for you if you don’t mind. Is it only me or do a few of the remarks come across as if they are coming from brain dead individuals? 😛 And, if you are writing at other places, I would like to keep up with everything fresh you have to post. Would you make a list every one of your community pages like your twitter feed, Facebook page or linkedin profile? I usually do not comment, however I browsed through some responses on Girls Are From Venus, Men Are Barbarians (Or, The Myth Behind Makeup & Natural Beauty) | He Says, Zee Says. I actually do have some questions for you if it’s allright. Could it be just me or does it look like some of these remarks look as if they are left by brain dead people? 😛 And, if you are posting on additional places, I’d like to keep up with you. Would you post a list of all of all your public sites like your Facebook page, twitter feed, or linkedin profile? I leave a response when I appreciate a post on a website or if I have something to add to the discussion. Usually it is a result of the sincerness displayed in the post I looked at. And on this article Girls Are From Venus, Men Are Barbarians (Or, The Myth Behind Makeup & Natural Beauty) | He Says, Zee Says. I was moved enough to post a thought 🙂 I do have a couple of questions for you if you do not mind. Is it only me or does it look like like some of the comments come across like written by brain dead visitors? 😛 And, if you are writing on additional online social sites, I’d like to follow you. Would you list every one of all your social sites like your Facebook page, twitter feed, or linkedin profile? Everything composed made a ton of sense. But, what about this? suppose you typed a catchier post title? I mean, I don’t want to tell you how to run your blog, however suppose you added something to maybe get a person’s attention? I mean Girls Are From Venus, Men Are Barbarians (Or, The Myth Behind Makeup & Natural Beauty) | He Says, Zee Says is a little plain. You might look at Yahoo’s home page and note how they create news headlines to grab people to open the links. You might add a related video or a picture or two to get people interested about what you’ve written. Just my opinion, it could make your blog a little livelier. I almost never comment, however after browsing a few of the remarks here Girls Are From Venus, Men Are Barbarians (Or, The Myth Behind Makeup & Natural Beauty) | He Says, Zee Says. I do have some questions for you if you don’t mind. Could it be simply me or do some of the comments appear as if they are coming from brain dead folks? 😛 And, if you are posting at other online social sites, I’d like to keep up with you. Would you make a list of the complete urls of your social community sites like your linkedin profile, Facebook page or twitter feed? I leave a leave a response when I appreciate a post on a site or I have something to valuable to contribute to the discussion. Usually it’s triggered by the passion displayed in the post I looked at. And after this post Girls Are From Venus, Men Are Barbarians (Or, The Myth Behind Makeup & Natural Beauty) | He Says, Zee Says. I was moved enough to drop a commenta response 😛 I do have 2 questions for you if it’s okay. Is it just me or does it give the impression like a few of the remarks look like they are coming from brain dead individuals? 😛 And, if you are writing on other places, I would like to keep up with anything fresh you have to post. Would you make a list the complete urls of your social sites like your linkedin profile, Facebook page or twitter feed? I do not leave a ton of responses, however i did a few searching and wound up here Girls Are From Venus, Men Are Barbarians (Or, The Myth Behind Makeup & Natural Beauty) | He Says, Zee Says. And I actually do have 2 questions for you if you usually do not mind. Is it just me or does it give the impression like some of the comments look like they are written by brain dead visitors? 😛 And, if you are posting at other online sites, I would like to keep up with anything fresh you have to post. Would you list of the complete urls of all your communal pages like your linkedin profile, Facebook page or twitter feed? I seldom comment, however after reading some of the comments here Girls Are From Venus, Men Are Barbarians (Or, The Myth Behind Makeup & Natural Beauty) | He Says, Zee Says. I actually do have some questions for you if you do not mind. Could it be just me or do a few of the comments come across like they are left by brain dead visitors? 😛 And, if you are posting at additional social sites, I would like to keep up with everything new you have to post. Could you make a list of the complete urls of all your public sites like your Facebook page, twitter feed, or linkedin profile? I hardly leave responses, but I read a few of the remarks on Girls Are From Venus, Men Are Barbarians (Or, The Myth Behind Makeup & Natural Beauty) | He Says, Zee Says. I do have some questions for you if it’s okay. Is it only me or does it look as if like a few of these comments look like they are coming from brain dead individuals? 😛 And, if you are posting on other sites, I’d like to keep up with everything fresh you have to post. Would you list of all of your social pages like your Facebook page, twitter feed, or linkedin profile? wycinane w przybliżeniu w połowie. Komfort przez skończony rok Przy produkcji niższe rachunki wewnątrz ogrzewanie , geotermalne pompy ciepła są cichsze aniżeli konwencjonalne systemy a poprawić kontrolę wilgotności . ciepła pozwoli na elastyczność projektu natomiast przypuszczalnie stanowić instalowany również w nowych, podczas gdy natomiast modernizowanych sytuacjach . w budynku natomiast dać możliwość jednoczesne nagrzewanie natomiast oziębianie bez potrzeby systemu cztery rury. ulepszone Estetyka Architekci tudzież właściciele budynków , takie podczas gdy gibkość projektowania oferowanych przy użyciu GHPs . z uszkodzenia pogodą natomiast potencjalnego wandalizmu. and do it! Your writing taste has been amazed me. Thank you, quite nice article.